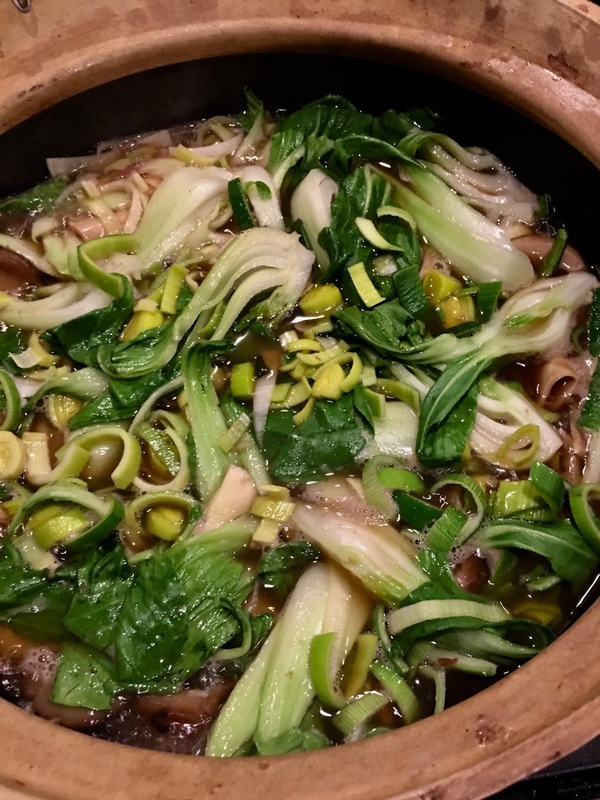 We used to order this at our favorite Shanghainese restaurants without fail during Taipei’s dreary season, which stretches unbroken from November through March. With a couple of bowls of this inspired soup—which manages to be hearty without being terribly filling—we’d happily brave the weather and splash in the puddles afterwards. The only really unusual ingredient is băiyè jiĕ 百葉結, or fresh bean curd knots. At the time of this writing, they can be most usually found fresh or frozen in vacuum-packed 8-ounce packages. If your Chinese market doesn’t hold them, you can roll up sheets of fresh “hundred leaf” bean curd (băiyè) and tie them in knots. 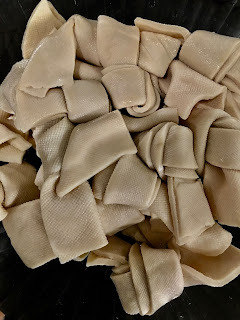 And if even that isn’t available, just cut very firm fresh bean curd into squares and call it a day; they won’t need soaking, so just toss them in the soup. Two ingredients are absolutely essential here: good ham and good Shaoxing rice wine. Chinese ham is sometimes labeled Smithfield in Chinese markets, and it’s a much saltier and drier ham that what Americans usually eat; Spanish jamón or Italian prosciutto are great substitutes, and if you can find the ends, they’ll be both cheap and flavorful. 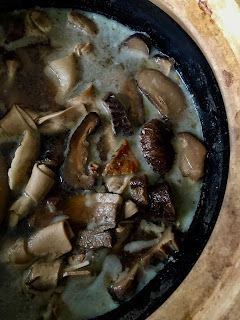 There are not a whole lot of substitutes for the toasty, mushroomy aroma of Shaoxing rice wine, but in case of an emergency, use dry sherry instead. The first four steps should be done more or less at the same time, as this is all prep work. As with just about every good soup, though, this tastes much better if it is made at least a day ahead of time. So, if you can, assemble it up through Step 5 the first day, so that the flavors have the time to marry, and then proceed with Step 6 just before serving. 1. Again, start this recipe at least a day before you wish to serve it. Place the stock in a large (2 quart | 2 liter) sandpot or casserole. Wrap the peppercorns in a piece of cheesecloth or a tea ball. Toss in the mushroom soaking liquid, Sichuan peppercorns, ginger, green onions, and rice wine, but don’t add any salt at this time. Reserve the mushrooms for Step 4. Bring the pot to a boil before lowering it to a simmer, and then cover lightly. While the stock simmers, prepare the rest of the ingredients. 2. Rinse the ham and pork and blanch them in boiling water for about 10 minutes. Rinse them off again, scrape off any black areas on the ham skin, and return them to a clean saucepan and cover with water. Boil the meats for around 30 minutes and remove the pork. When it is cool, slice it against the grain into thin pieces. 3. Continue to cook the ham for another 30 minutes, or until it is tender enough to be easily pierced through with a chopstick. Remove it from the ham stock. When the ham is cool enough to handle easily, slice off and discard any skin, gelatinous bits, and bones, and then cut the ham into thin slices. Ever ham has a different level of salt, so pour the ham stock a bit at a time into the pork stock until it is as salty as you like; reserve the rest of the ham stock for later. 4. 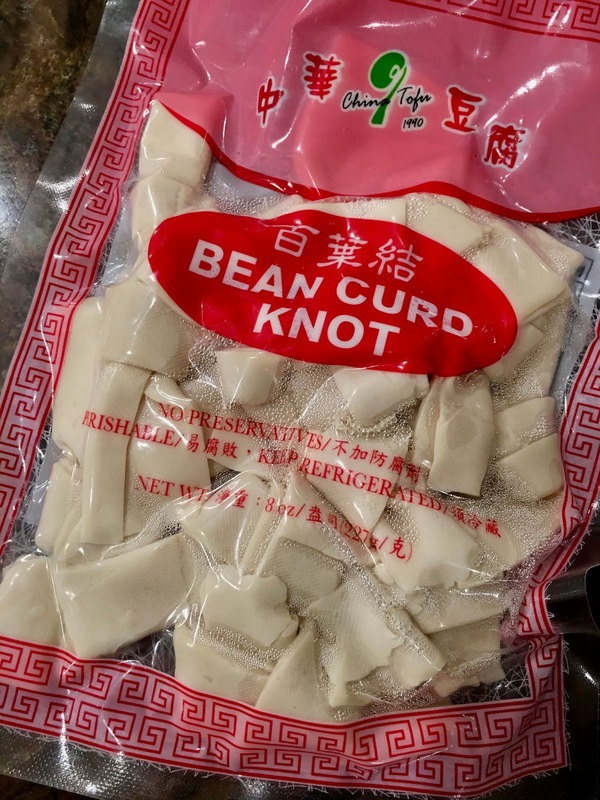 While the pork is cooking, place the bean curd knots in a heatproof bowl and cover them with the boiling water. Add the baking soda and stir. After about an hour, the knots will have plumped up. Rinse the knots in several changes of water. Slice the mushroom caps into pieces about ¼ inch | 6 mm wide. 5. Remove the Sichuan peppercorns, scallions, and ginger from the stock and discard. Arrange the sliced ham, pork, bamboo shoots, mushroom caps, and rice wine in the stock. Bring the soup to a boil. Lower the heat to a simmer and cook the soup for around 30 minutes. Taste the soup and add more pork or ham stock as needed to cover all the ingredients. Add the bean curd knots and simmer the soup for another 20 to 30 minutes. If you can, make it up to this point and let it sit covered overnight in a cool place. 6. Place the ice cubes on top of the cool soup, and after a few minutes remove any coagulated fat and unmelted ice cubes. Heat the soup up until it is at a full boil. Just before serving, taste the soup again and add more rice wine and ham stock to taste; there should be a nice, winey punch to the soup, and you can adjust the seasoning as you like with a pinch or two of salt, if necessary. 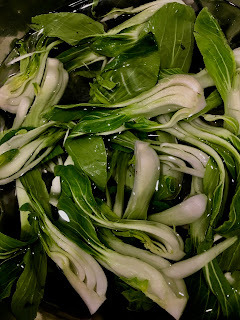 Add the bok choy and leeks to the soup and bring it only to a boil, as you want them just barely cooked through. Set the sandpot on the table and serve in small soup bowls.